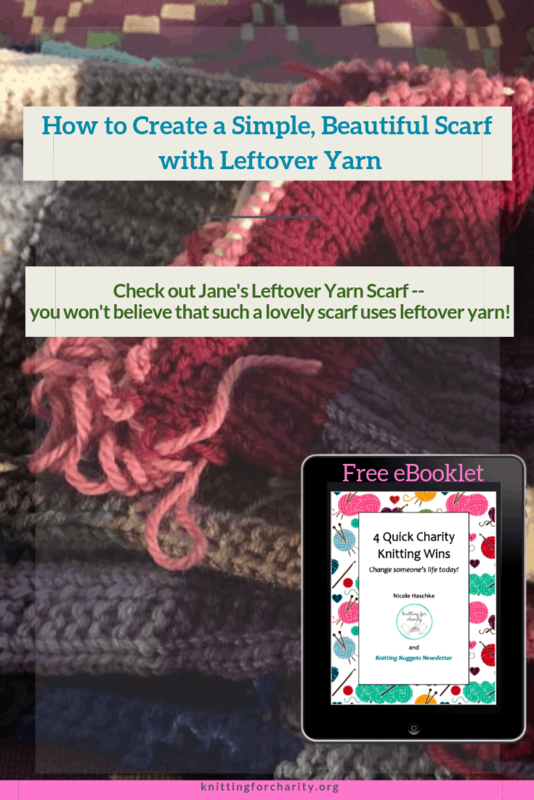 Check out Jane’s Leftover Yarn Scarf — you won’t believe that such a lovely scarf uses leftover yarn! Leftover yarn. It’s so hard to know what to do with it sometimes, isn’t it? I think the most frugal knitters among us absolutely hate to throw out yarn. It seems so wasteful, even if I have really tiny amounts. I have often wound up balls of yarn that were about the size of my thumb. Yet I still couldn’t bear to throw them out! Fortunately, stripes are a great way to use up tiny amounts of yarn for just about any project. I’ve used leftover yarn to knit up tiny quantities of sock yarn into preemie hats, or slightly larger amounts of yarn for adult hats. As I have confessed in the past, though, I do sometimes find stripes a little dull, particularly if they’re stockinette. Stockinette stitch is probably the prettiest way to knit stripes, but miles of knit stitches tend to make my eyes cross, even when I get to change color frequently. Regardless, I do love stripes, and I’ve written about ways to spice up stripes before. I’ve also written about ways you can avoid stripe issues, like the dreaded “jog” in circular knitting or changing colors in flat knitting (without breaking the yarn every time). This photo and caption blew my mind! Not only was Jane knitting this beautiful scarf solely from leftover yarn, but she was also going to donate it to charity to help Syrian refugees. Amazing! I shared her photo to the page timeline to make sure everyone saw it, and naturally someone asked for the pattern. I asked Jane about the pattern, and she explained that she just made it up herself. Very graciously, Jane agreed not only to write it out for me, but also to let me publish it here. So without further ado: Jane’s Leftover Yarn Scarf! Cast on 60 stitches using either chunky yarn or 2 strands of DK-weight yarn held together on 5.5 mm needles (US size 9, UK size 5). Bind off when you reach your desired length. The scarf you see here is 15 inches (40 cm) wide and over 5 ft (1 m, 80 cm) long. 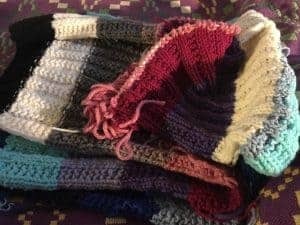 Each color is about 4 inches (10 cm) wide, with 18 rows per color. Oh, and by the way, don’t forget that you can hold different colors of yarn together as well. It makes an interesting, almost tweedy effect. 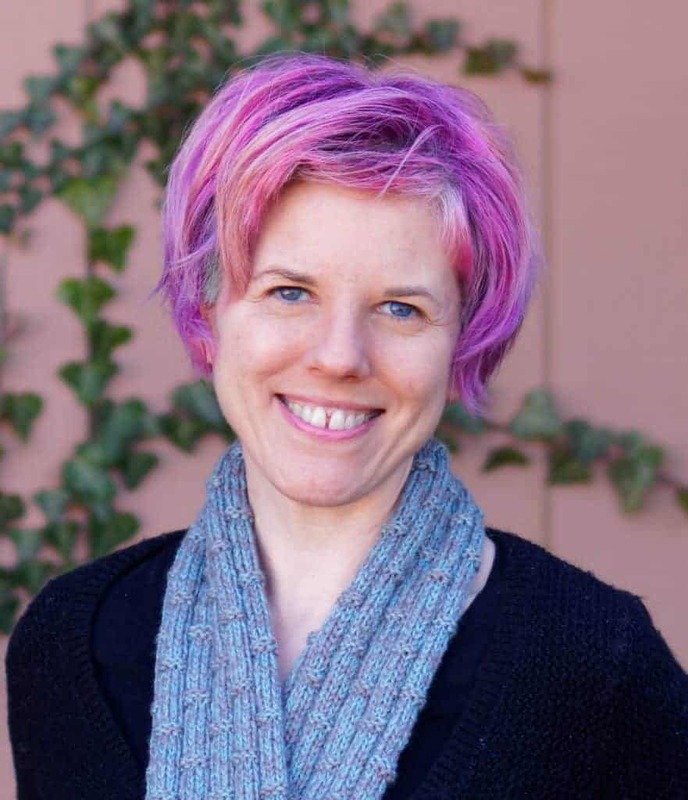 Many thanks to Jane for offering us her simple, beautiful scarf pattern! I’m so inspired to start looking for more fun ways to use my leftover yarn. Aren’t you?